A herd of Zombies (I’m not really sure what you call a group of the undead) invaded Phoenix tonight for the city’s first Zombie Walk. About 200 people participated in the mile and a half shuffle, which ended, oddly enough, in a bar. They wandered through downtown mingling with shoppers, people on their way to theatre events and sports venues, attacking random “victims” gnawing on their extremities and trying to consume their brains. 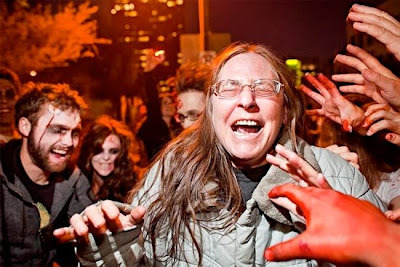 Some passersby didn’t quite know what to make of the undead, but most took it in the spirit with which it was intended. There are more photos from the Zombie Walk in my PhotoShelter archive and atZUMA Press.